The environment a microorganism inhabits dictates the metabolic ­capacity necessary for it to survive, and ultimately the minimum size which an organism can achieve. Nutrient rich environments such as those experienced by parasitic bacteria can accommodate organisms with restricted metabolic capacities with relatively few genes, perhaps as few as 250. Nutrient poor environments, such as those experienced by autotrophs, provide only minerals and gases and require high biosynthetic capacity to synthesize all cellular carbon from CO2. This high biosynthetic capacity requires at most 1,500 (an actual value) and perhaps as few as 750 genes. 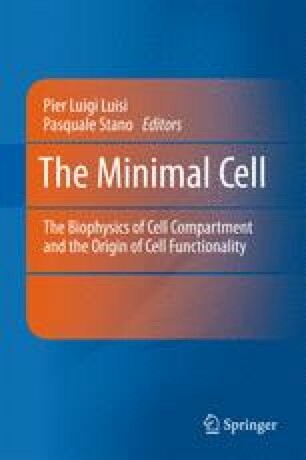 Calculations show that as theoretical minimal cell size is decreased, the cellular volume devoted to the DNA required to encode the minimum gene ­complement becomes a limiting factor in further reduction. Assuming composition of 50% water, 20% protein, 10% ribosomes and 10% DNA, a spherical cell with minimum biosynthetic capacity (250 genes) would be at least 172 nm in ­diameter. A cell with high biosynthetic capacity (750 genes) of the same composition would be at least 248 nm in diameter. It is concluded that cells with biochemical ­requirements for growth, metabolism and reproduction similar to those of known organisms cannot be smaller than 172 nm.